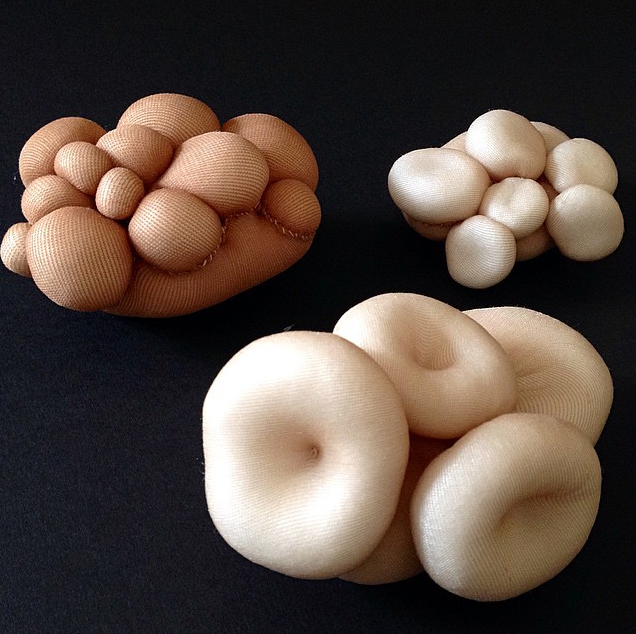 Usvitsky’s work is sturdy but soft, the pieces are molded and sewn to form cocoons both similar and otherworldly. The art resembles cells, atoms, eggs, bacteria, cancerous growths and fungi. This work has become a stand in for the body, and femininity. Sewing, often dismissed as a domestic practice, is celebrated in the work. Some pieces hide the stitches while others wear the scars proudly. The work seems to be all about bypassing the surface to dig deep into the subconscious. The art is as inviting as it is repulsive. While containing an inherent sense of comfort, the soft materials are also transformed into grotesque, overgrown shapes and holes that are reminiscent of body parts we often keep under wraps. This entry was posted in exhibitions and tagged exhibition, fiber, katya usvitsky, opening, sculpture. Bookmark the permalink.